Working together for your financial future. Barreto Inc. can draw on a full array of financial products. 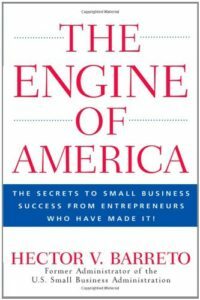 The Engine of America – Hector V. Barreto Jr.
Winning business strategies from CEOs of 50 successful small businesses (some of which are now large corporations) who share their experiences to help those starting or growing their own business.